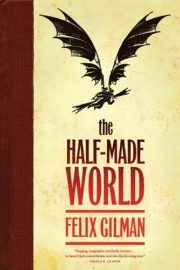 Felix Gilman’s 2010 novel The Half-Made World takes us to a continent whose westernmost expanses are still forming out of primordial chaos. Demons and worse lurk there. Two monstrous factions struggle for control of the new frontier: the Gun, a cabal of possessed warriors doling out violence and cruelty on a retail scale, and the Line, a horrific railway that serves up terror and oppression wholesale. Here and there are pockets of free people, but their freedom is doomed. Despite the Gun’s best efforts, the Line is inexorably consuming the whole of the continent. Victory seems assured. At least, it does until a rumour begins to circulate.